The face paints were amazing!! Fantastic talent and so much patience with the children loved it! We were blown away by the face painting, balloon twisting & entertainment. Ditzy was so friendly & professional, the whole day was perfect. Thank you for Saturday! The kids LOVE you and your paintings are brilliant!!! The face painting designs were beautiful and creative and I even got mine done!! Definitely recommend to everyone and I’m going to re-book for other parties! Just a quick message to say thank you very much for working so hard at the event in Flint on Friday. Despite the bad weather the event was successful and we had positive feedback. 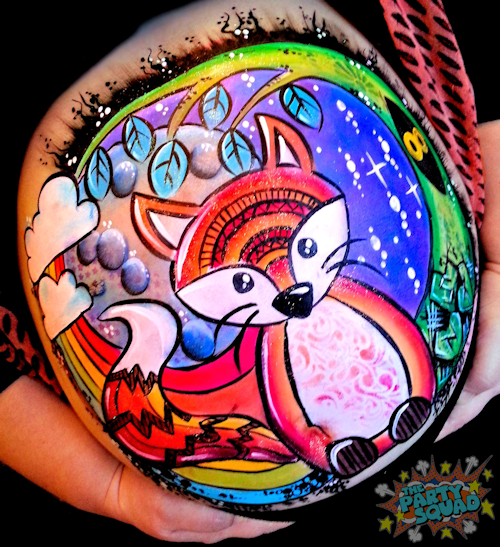 Ladies and Gents, there is Face Painting like this…. or there is Face Painting like you’ve been hit in the face with a wet fish! I know which one I would choose, and it doesn’t smell of Tuna! 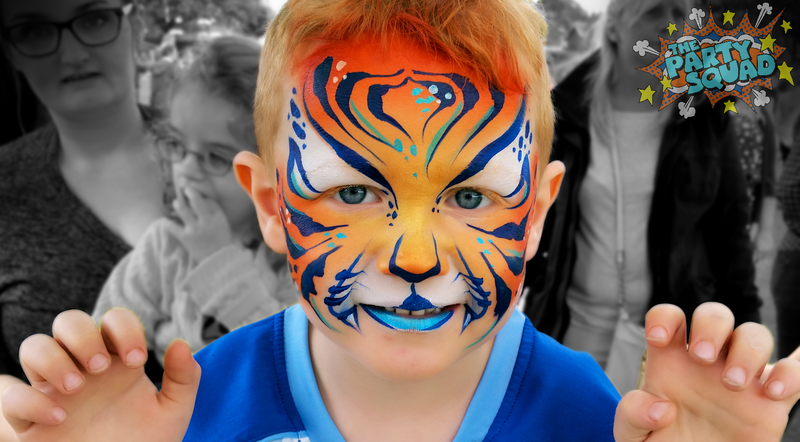 Face painting is loved worldwide and Ditzy Doodles can literally paint smiles on faces at your event, suitable for children age 3 and over! Ditzy Doodles has been very lucky to paint many, many children across the North West from house parties, to large 5 day events! 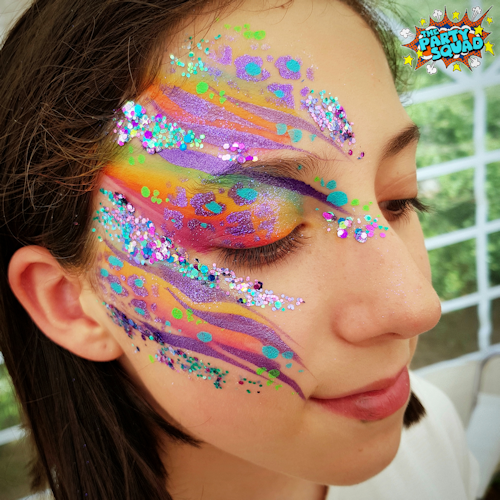 No matter what the occasion, whether it’s a family celebration or a corporate fun day, you need a face painter with experience, who is skilled enough to paint what the child would like. Offering a high quality face painting service, you won’t be disappointed with the artistry from Ditzy Doodles, lead face painter (and general nutter) for The Party Squad. Are you looking to add a bit of sparkle to your event? Bring on the Bling by inviting The Sparkle Squad to your festivals, tween/teen celebrations, UV Events and more! 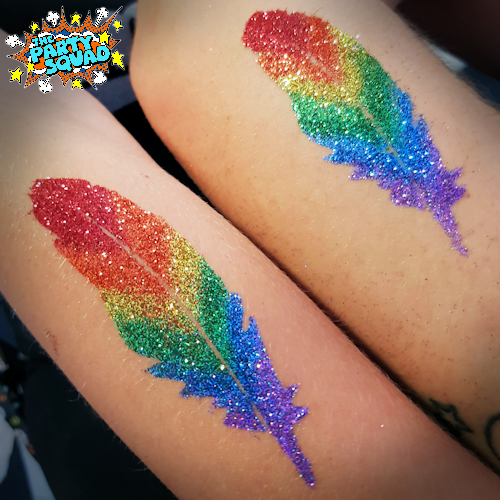 Using only the sparkliest of sparkles suitable for cosmetic use, The Sparkle Squad, can create fresh designs for all who love glitter! Face Painting & Balloon Twisting Packages don’t compromise on quality, you will be happy with any choice you make with The Party Squad. 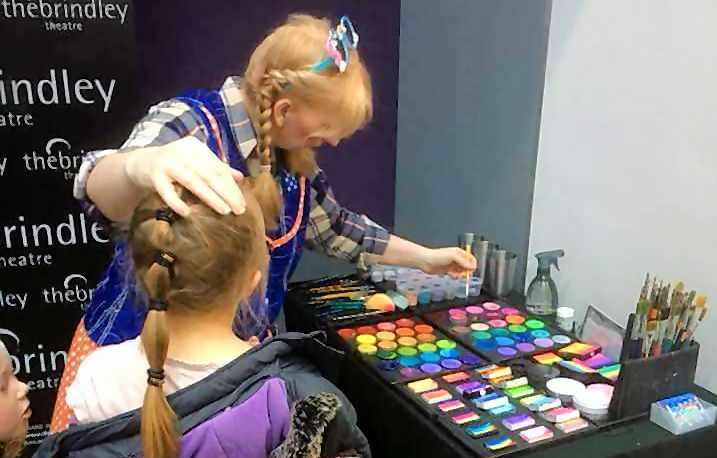 From face painting for up to 25 children with Smiles & Sparkles, or, why not have the best of both worlds with the Twist & Smile Package with face painting & balloon twisting available for up to 15 children! YES, I want this painty package! If you need a team of painters for larger events, The Party Squad offers quality face painters with professional face painting kits, who adhere to stringent health and hygiene practices. From family fun days to festivals, everyone loves face painting. Our reputation is your reputation. All our team painters are self contained and provide face painting kit, seating and table, and have Public Liability Insurance. ASK ABOUT THE PARTY SQUAD LUCKY DIP SERVICE! Perfect for corporate events when budgets are limited! in a unique and fun way for children! It’s always a surprise as to what each child will receive! BT Warrington – O2 Preston Brook Call Centre – Runcorn Shopping Centre – Stockley Farm – The Lodge Community Centre – Asda Runcorn – The Brindley Theatre – Halton Royal British Legion – Runcorn Linnets Junior Football Club – Knowsley Council – Tiny Steps Nursery – Mersey Forest – Halton Carers Centre – Halton Borough Council – Twiss Green Primary School – Weston Kids Club – Pryors Hayes Golf Club – Burger King – The Labour Party – Flintshire County Council – Runcorn and Widnes Children’s Centres and more!